The new Baby Carrier One is our very latest baby carrier - recently updated in fall of 2015 to create a more comfortable and ergonomic carrying experience for both you and your child. It is ideal for those wanting an ergonomic baby carrier with incomparable comfort, and a must for those who want to vary the way of carrying for long periods. The new Baby Carrier One is equipped with an extra sturdy waist belt for added pressure relief, allowing you to support the child's weight on your hips, and avoid potential back and shoulder discomfort. 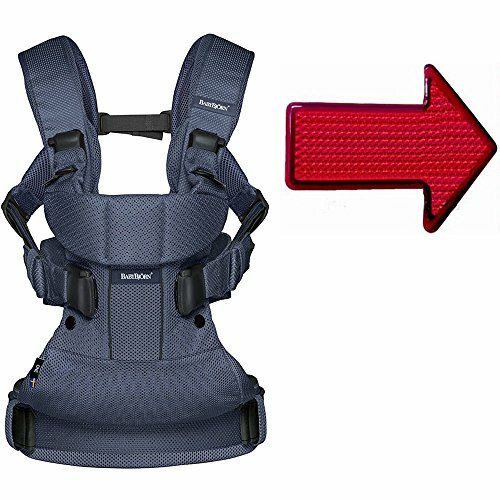 We also significantly increased the padding in the form-fitting shoulder straps to help you comfortably and safely carry a growing child from newborn up to the age of three years. You can vary between four ergonomic carrying positions throughout the period of use, with your child sitting in either the normal or wide leg position. Other improvements, such as lock-in-place zippers, will make for an overall better baby wearing experience. The new Baby Carrier One is all you need. We have also included a BONUS Safety Reflector at no extra charge!